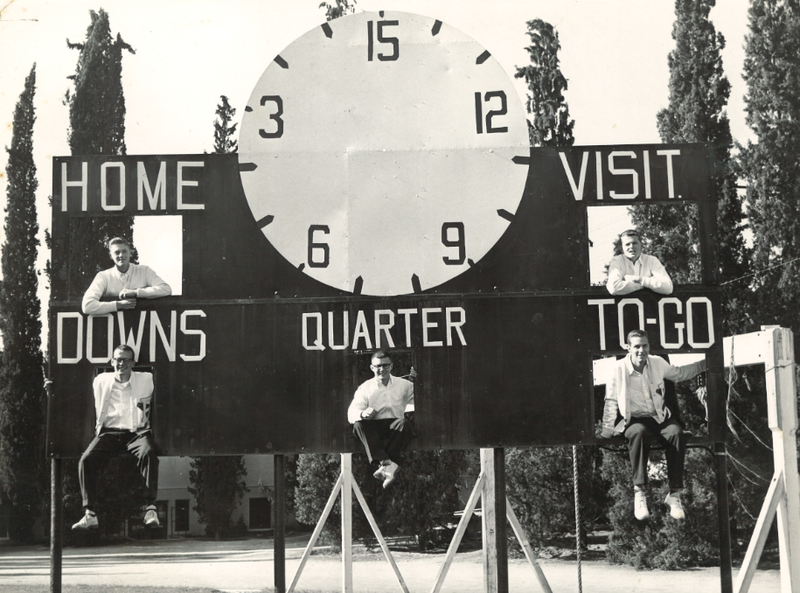 RAH-RAH-RAH: Pomona-Claremont’s cheerleaders (from left) included Chuck Campbell ’56, Bob Harrington ’56, and three counterparts from Pomona. In the spirit of the rediscovery of the late Stuart Briggs’ ukulele (see last issue’s Endpaper), an old letter from the late Charles B. Campbell ’56 recently landed on the desk at CMC Magazine, including two photos dating to the mid-1950s. Female cheerleaders might be the norm today, but not in the 1950s. Nationally, in fact, cheerleading started out as an all-male exercise—for the earliest examples, look back to Princeton or the University of Minnesota in the late 1800s. CMC created its own cheerleading squad with members from both CMC and Pomona College. We’re very glad Mr. McEwen chose to keep Campbell’s letter and forward it on to the College. The resurfacing of old photos from CMC’s earliest years is always something to cheer about.